Today I just proved to myself I can have self-control. It just takes a tight schedule, the need to get home to use a clean restroom, extreme thirst, a very short list, and the determination to only buy as much as you can carry in your hands. The Back-to-School bins are full and ready to go at Walmart!!!! I love back-to-school shopping in the biggest way. Yes, love is a strong word, but I love it. It was all I could do to contain myself when I entered the store and saw aisle upon aisle of glorious school supplies!! However, school doesn’t start for 6 weeks and I was strong. 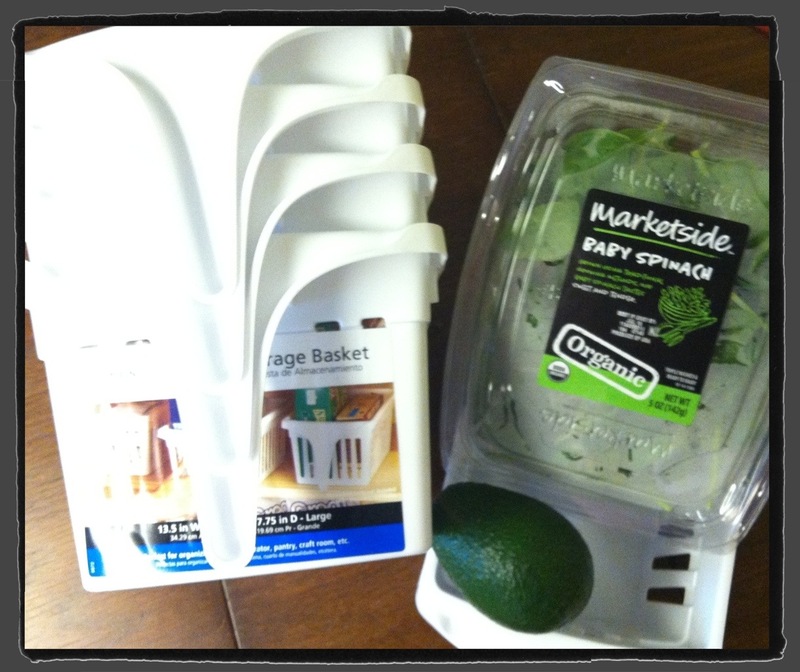 I left only with what I came for: storage solutions for my fridge, spinach, and an avocado. In all fairness, organizing and avocados rank pretty high up on my “Things That Make Me Really Happy” list. So, it wasn’t a complete sacrifice. They were empty…can you believe that? People are so fast…just as good though. It’s not like i needed anything but i thought my twin girls could use a few markers or crayons. Will go back next week!!! Wow! That is crazy! They have some pretty good deals though so I can understand why people buy it all. How old are your girls? Adorable!! I love that age! 2-3 years old is the BEST time ever and you have double the fun! Sometimes it feels like work lol. They want to play, or read. I want to sleep or sleep lol. Thank you! mmmmmm…Avocados! Those are always a must! And it was delicious on my taco salad! Oh my goodness. I have self control issues with school supplies too! Unlike you, I don’t have an excuse; my children are adults. Wel, true, many of the supplies are for ME! I have my own personal set of supplies I keep in my desk -you know, a full set of Crayola markers, sharpened colored pencils, glue, and I LOVE folders.